Hansoft is an enterprise Agile planning tool that provides a single platform for decision-making at the project, program, and portfolio levels. Diverse and dispersed teams, expanding scale, changing goals, tight schedules — Hansoft solves the whirlwind of challenges facing organizations today. So you can plan, track, and manage your products to stay competitive. One backlog for the entire organization — teams, managers, execs. Proven at 10,000+ users. Supports large-scale Agile frameworks. Supports Scrum, Kanban, and Waterfall methods and hybrids. Accelerates planning efficiency by up to 20%. Plan and adapt at scale for maximum value delivery. Watch ideas become high-level plans. Plans become priorities. Priorities become to-do items checked off by productive team members. With minimal click-wait experience, and the ability to react to change in real-time, Hansoft customers experience up to 20 percent increases in planning efficiency. Inspired by Scaled Agile Framework (SAFe), Large Scale Scrum (LeSS), and the Project Management Institute (PMI), Hansoft can be structured around the precise needs of your organization. With a true product backlog, scale easily without creating silos that compromise collaboration. Stay informed of progress through real-time dashboards. Make just-in-time decisions based on real-world data. Manage dependencies and workflows to reduce bottlenecks. With Hansoft, the entire organization can see how their work contributes to big-picture goals. Schneider Electric evaluated 13 different Agile planning tools. See their story and discover why they selected Hansoft to scale Agile across the enterprise. Looking for a new solution? Avoid these common mistakes. Hansoft provides an unrivaled combination of structure and flexibility. Keep all data across programs and portfolios in one place. Executives can manage risk, budgets, whatever they need for simple, effective decision-making. 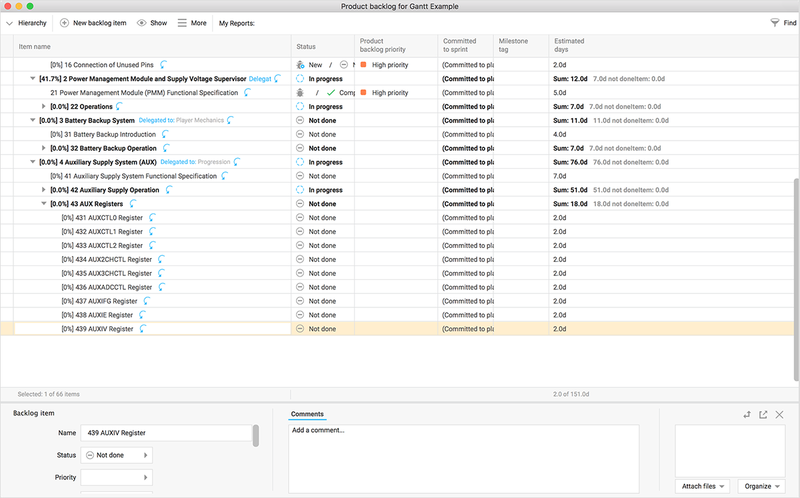 Hit deadlines and resolve dependencies with Gantt charts. Easily combined with scrum and Kanban boards, Hansoft’s Gantt charts are prized for providing high-level roadmaps. Create burndown charts (and deliver on them). Write detailed user stories and break them down. Estimate using any metrics. Combine with Gantt charts for hard dependencies. Minimize waste. Create custom cards to visualize workflows and bottlenecks. Limit Work in Progress to increase value delivery and overall efficiency. Give team members clarity and confidence in the workday. Icons provide insights at a glance. No more wondering what to do next. The built-in quality assurance section keeps teams on top of bugs and issues. Let testers into the backlog while protecting IP through granular permission levels. 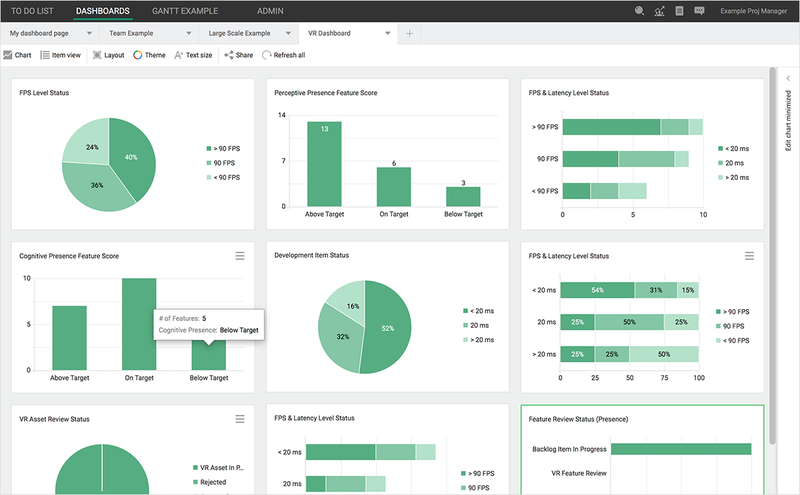 Visualize progress with custom dashboards. Discover new insights easily. Hansoft empowers everyone, including decision makers, with the right data to move forward. Justify decisions through reports customized for your audience. Stakeholders, executives, product owners alike appreciate how simple reporting is with Hansoft. A healthy product backlog is critical to modern planning. Hansoft lets you structure your way. Refine, prioritize, estimate, and give any other custom attribute to your deliverables. Modify your team at the speed of project and business change. Optimize human resource allocations to boost productivity, save time, and increase efficiency. Hansoft is easily deployed on-premises with strong security mechanisms to protect your organization. Hansoft also has a cloud option. Hansoft integrates with Perforce Helix Core, LDAP, Jira, and Git. The SDK opens up possibilities for further integrations and customizations in any major .NET language. "I spent three weeks trying all the tools I could find and Hansoft came out as the clear winner." Indie Game Studio? Get high-performance tools from Perforce. Global companies in the electronics, aerospace, automotive, and manufacturing industries use Hansoft to plan and ship better products faster. See how Hansoft powers the enterprise.